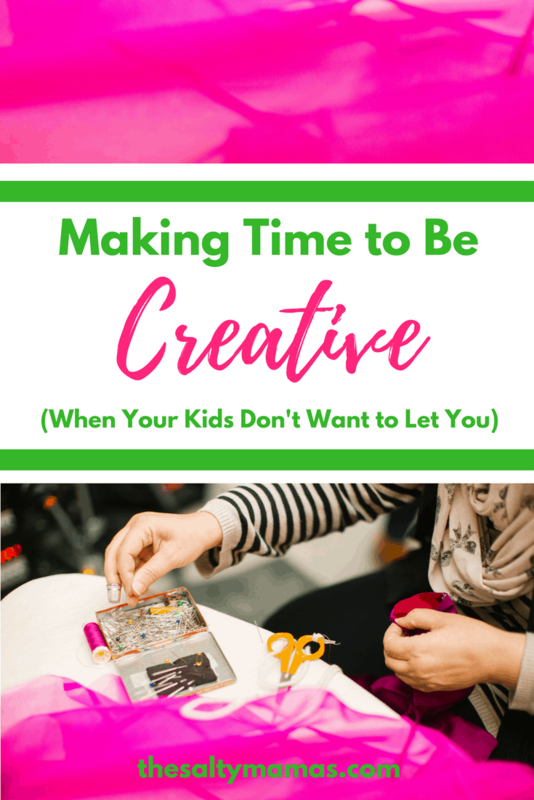 Let’s preface this one by saying- you don’t HAVE to be creative just because you’re a mama. Your parties don’t have to have carefully paper-crafted banners. Your kids’ sandwiches can be sandwich-shaped, your kids water cups don’t have to be personalized with vinyl, you don’t have to make your own home décor, and you CERTAINLY don’t have to sew your daughter thematic skirts for every holiday. But some of us? Some of us WANT to. Not because society tells us we’re supposed to (although, let’s be real, that’s also true), but because we are creative types and we need that kind of outlet. And when you have tiny little monsters running around your house, it is really hard to pull off something that takes a lot of time. Or attention to detail. Or maybe anything that requires the use of scissors, because suddenly your one year old is now tall enough to reach things on the kitchen table and DANGEROUS. The first step, for me at least, is to make a plan. Like, an ahead of time, I’m-gonna-be-creative-on-purpose plan. These days, I use my Passion Planner as both a creative outlet and a planning system, so of course, I have my creative project list in there. But before that, I had Pinterest Boards, divided by type of project, length of project, and projects I wanted to accomplish sooner than later. Next, I take a look at the list and spend a little time figuring out what I need to accomplish the project. Do I need special paint? Vinyl? To take my kids’ measurements ahead of time? I figure out the action items, hunt things down on Amazon, jot down the kids’ sizes, or include a trip to Joann’s in my weekly errands. Now I’ve got the dream and the materials, and it’s down to the hardest commodity-time. The thing about kids is you never know when you’re gonna get a minute to yourself. Will they both miraculously be napping at the same time? Will someone scoop your older one up for a playdate, and your little one will be in a good mood for once? Will they go to bed early after a day of swimming? The beauty of it is, you’ve planned for this obscure little window. You have the plan, you have the supplies, and so when you finally get the time- you just go for it. I pull up my Pinterest Board of “Nap Length Projects” (In case you were wondering just how Type-A I am, this should pretty much explain it), I choose one, and I make it happen. So is over-the-top crafting part of motherhood? Well, it sure doesn’t have to be. But with a little planning, motherhood also doesn’t have to be the reason you give it up. Happy crafting, mamas-who-are-into-that-sort-of-thing!